The filter technology is decisive in determining the longevity of an extraction unit. The elementary extraction of hazardous substances is decided inside the device. A major factor in determining service life whether it should be a storage filter or an extraction unit with a cleanable filter. Which filter technology is the right one for the respective requirements of the metal processing company depends on the purpose and duration of use. 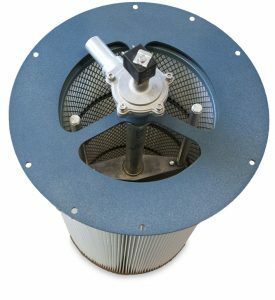 When it comes to extraction in heavily fuming processes, there is no alternative to cleanable filter media. If fumes emission is comparatively low and the unit is only used for a few hours a day, the cheaper filter unit with storage filters may be the right choice. The differences in approach mean that the two filter types need to have different characteristics. 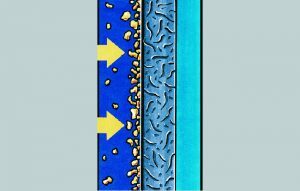 While experts speak of depth filtration for disposable filters, cleanable filters involve surface filtration. 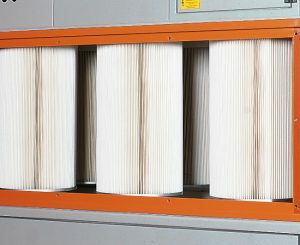 To understand this connection, it is necessary to imagine how the different filters work in the extraction unit. As the name suggests, storage filters need to be exchanged for a new filter medium at some point. 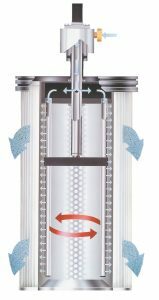 The filter technology in the extraction unit must therefore be designed in such a way that it can store as many hazardous substances as possible – and ideally over a long period of time in order to keep the costs for new purchases low. To guarantee this, the filter area must be as large as possible. They are therefore designed in such a way that the fine dust particles captured during welding fume extraction reach the inside of the filter medium. This depth filtration is designed three-dimensionally to achieve a maximum dust storage capacity. If the particles were to collect exclusively on the surface, the filter medium for storage filters would quickly become clogged. However with storage filters, filter medium composition is such that the particles can penetrate the interior of the filter medium. They are deposited there Over time the filter becomes increasingly saturated, from the inside outwards, until a filter change becomes necessary and is indicated on the extraction unit. 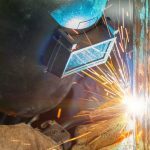 If you weld with high intensity and generate large quantities of welding fumes, then you require a larger filter area than sporadic welders. 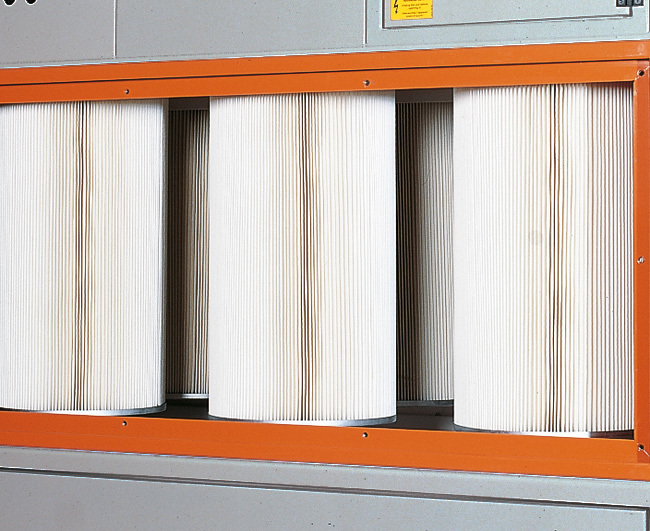 The larger the filter surface is, the greater the filters so called dust storage capacity is and therefore its service life before the next filter change. 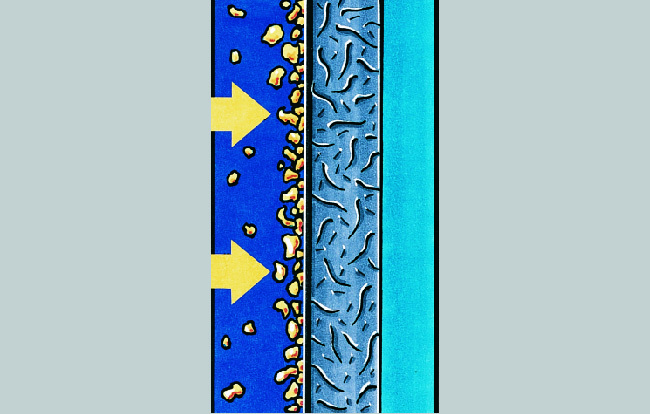 In contrast to this is the filter technology of the cleanable filters: Welders opt for this to avoid regular changes. It is true that costs for the initial purchase of the extraction unit are usually higher than with disposable filter units, but the investment quickly pays for itself where fumes are considerable and/or a lengthy operating period is involved. 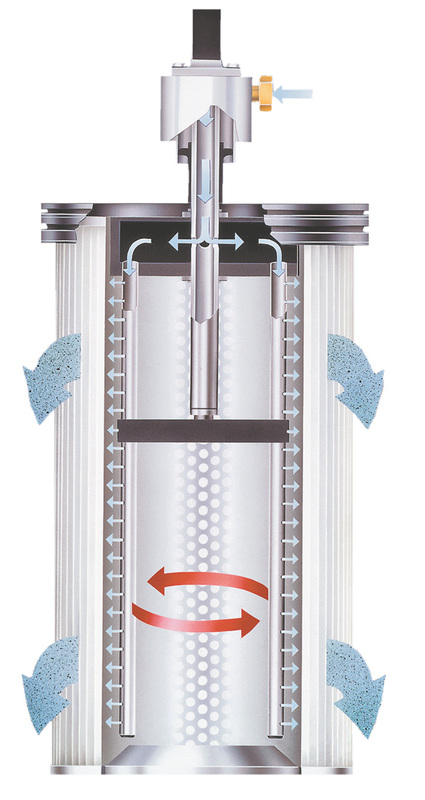 To allow cleanable filters to remove the hazardous substances during the cleaning process, the fume and dust particles must not penetrate the depth of the filter medium. Because when cleaning, which is best imagined as backwashing the filter with compressed air (even if they are other operating mechanisms), the particles must be released from the filter medium again. And this is almost impossible once they get caught in the depth of the filter medium. It is therefore important to capture the particles directly on the surface of the filter medium. Under a microscope, this “surface” does not really resemble a surface, but rather a tangle of ultra-fine fibers. This tangle is made to be as dense as possible. Technically very good, but complex in production is a laminated, stretched Teflon membrane (ePTFE membrane). It has extremely fine pores and the Teflon is dirt-repellent. We all know it from the non-stick coating of the frying pan. The type of cleaning ranges from the simple cleaning of folds using pulses of compressed air (so-called jet pulse cleaning), to the highly effective but equally gentle cleaning using compressed air-driven rotary nozzles. Of course, such an effort causes costs, but it pays for itself through a long filter service life. 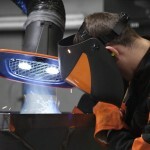 Companies that weld a lot and generate large amounts of welding fumes are well advised to use such solutions. There is, however, one limitation. 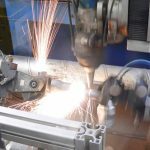 If heavily oiled parts are welded or oily parts are only tack welded, for example in the automotive industry, the proportion of oil mist in the welding fumes is relatively high. The oil diffuses through the ePTFE membrane – just consider how oil reacts in a Teflon-coated frying pan. In these cases, resourceful experts use non-membrane materials and use additives to both improve cleaning and bind the oil. Or, in the case of small volumes of fumes, the storage filters mentioned above.